The shadowy world of film noir represented all that was scary, unknown and uncertain about the world circa 1950. With the rise of the blacklist and HUAC, film noirs allowed directors a chance to comment about themes regarding persecution and exile. Or, with director Joseph Losey’s The Prowler, the fear of obsessively coveting something. (Losey would eventually flee the US in light of HUAC, while screenwriter Dalton Trumbo, writing under a pseudonym would find his career over because of it.) For Losey and Trumbo, it was Joseph McCarthy’s obsessive need to prove he was right that brought everyone down, but you really have to dig under the surface to find that in The Prowler. Take that away, and you still have a provocative 1950s examination of stalking and obsession that isn’t romantic (no lilting strains of Endless Love playing here), but instead shows love – the love for one’s country? – as dangerous, intriguing, and all-consuming. VCI’s recent Blu-ray will give this forgotten gem a much needed boost. Susan Gilvray (Evelyn Keyes) calls the police one night after seeing a prowler at her window. Two officers respond, one of them being Webb Garwood (Van Heflin). Webb takes an instant liking to Susan, and finds ways to come to her house repeatedly. The two develop a relationship, but Susan wants to end things because her husband has threatened to kill himself and her if she leaves him. Torn between two men, each desperate to possess her, Susan and Webb end up committing a crime that affects both their lives. A woman in a towel stands in her bathroom looking at herself. The audience, through the eponymous prowler’s eyes, gazes at her through the open window. The beginning of Losey’s The Prowler certainly situates us in a dark, seductive world that feels scummy and exploitative. The woman, Evelyn Keyes’ Susan, screams and scares both us and the prowler away, leading into the beginning of a roller-coaster story of madness that never completely goes away. Losey wants audiences to question relationships, and where the line is between normal affection and something scarier. Much of this goes back to Losey and Trumbo’s questions about duty and love for one’s country during HUAC, but as a relationship noir it also attacks those stories about romance and murder that audiences ate up in the 1940s; films like Double Indemnity and The Postman Always Rings Twice where the romance came from the mutual desire to murder, usually led by the woman. In this case, Susan is a woman genuinely torn by a mutual love for her husband and for Webb, and Webb’s ways of romancing come off as terrifying, not charming. It would be several decades before stalking and abusive relationships were recognized, but The Prowler confronts the real-life issues head-on. Susan finds genuine romance – and all that comes with it! – with Webb, but he’s no better than her controlling husband. However, where Susan’s husband sees an object to lock inside his beautiful house; a trophy he can use as a catchphrase – “I’ll be seeing you, Susan” – on his radio show where he plays a devoted husband, Webb sees a means of social ascension; she grew up in the part of Indiana with lawns, according to Webb. 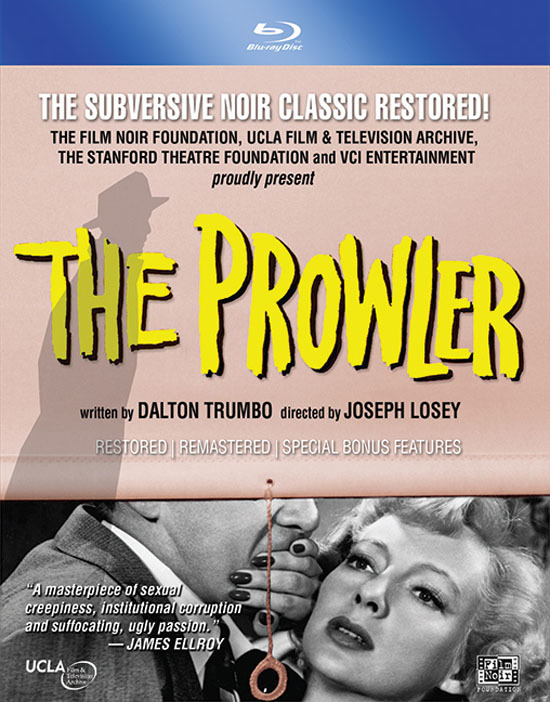 The Prowler was produced through Horizon Pictures, John Huston and Sam Spiegel’s production company. Huston was married to Keyes at the time, so the film was meant to showcase her talents. Trumbo’s script presents Keyes very sympathetically. She isn’t the scheming femme fatale ready to off her husband for the first guy making eyes at her. In fact, there’s no real object of desire point-of-view we see in other film noir (no Walter Neff leering at a scantily clad Phyllis Dietrichson). It’s alluded, although never proven, that Webb is the prowler who lays the foundation for our film, but even then, the audience isn’t see Susan as an object of desire, more an object desired by a crazed mind. She also suffers from the normal problems women continue to face today; when the cops arrive, they tell her to keep her shades closed so men aren’t “tempted.” When Susan’s husband is eventually murdered, she’s horrified and turns against Webb, showing her love for her husband. 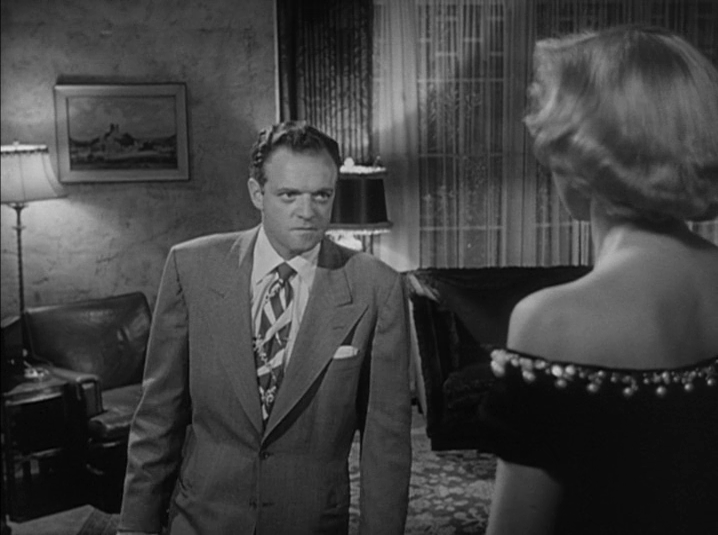 Van Heflin’s lecherous smile keeps the audience unnerved throughout the movie. As mentioned already, he isn’t the romantic hero you’re hoping will sweep Susan off her feet and save her. No, he wants the social cache – and the wealth – she brings with her. He loves her, of that there’s no doubt, but his love isn’t one of affection, but affection mixed with dominance. The way he stalks through the house, goes through Susan’s things, and eventually takes measures into his own hands to dispatch her husband, tell everyone (including Susan), who’s truly pulling the strings. On top of the movie critiquing elements of the noir, it’s also rather progressive in asserting how skewed gender dynamics are in favor of men. Speaking of Susan’s husband, the script rather ingeniously turns him into the unseen boogeyman of the film. Look at past film noir husbands – unattractive, older men married to, obviously, gold digging wives, right? We’re only ever told Susan’s feelings about her husband’s overbearing nature, but it’s never proven outside of conversations that could go either way. In fact, the movie makes a point of hiding Susan’s husband until the bitter end. He’s predominately a disembodied voice – screenwriter Trumbo’s voice – who, eerily enough, sees all; talking to Susan through the radio (this would make a great radio drama, by the way), reminding her to be a good girl. Even when he’s at home, we only hear his voice. When we do finally get a glimpse of him, played by Sherry Hall, it’s in Webb’s crosshairs, his final moments. In place of the tall, intimidating figure we’ve imagined, we see a scared, tired older man. With that fleeting glimpse, you feel instant sympathy for a man brutally murdered for what…having a wife he doesn’t appreciate? Or appreciates too much? The third act has baby makes three, and there’s a few too many moments of peril leading to a climax where Webb’s character takes an unexpected turn in personality. This feels like studio interference, or at least an attempt to please the Production Code. But, the brutal fact is, the thrill of the chase is just more compelling. Once Susan and Webb are together, there’s no more anticipation short of the expected perilous conclusion. Like all relationships, the honeymoon period ends, and while the film isn’t any less compelling, the excitement diminishes a tad. VCI’s Blu looks and sounds beautifully, and contains some engrossing featurettes discussing the film (particularly “The Cost of Living” featuring author James Ellroy and “Masterpiece in the Margins”) as well as audio commentary, photos, and a trailer. The Prowler is a fantastic, and subversive, film noir. Evelyn Keyes and Van Heflin give engaging performances in this bold assessment of the film noir genre. I’ve got this one waiting for me in the DVR. I’ve heard so much about it, can’t wait to watch! It’s amazing! Let me know what you think!